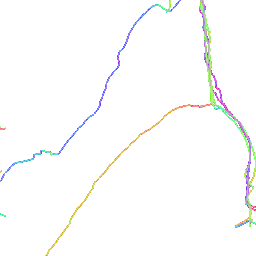 I have been taking some GPS traces on iPhone using the Trails app and then uploaded them to OSM. They import successfully but I can't get them to overlay on the map, neither on the editor on the website or in the Go Map!! App on iOS. I've tried setting them to all of the different privacy settings and still they don't appear. Other people's traces appear and if I click on my individual traces, they will overlay correctly on the map. Any ideas? I'm guessing that you're this user. Looking at this trace, it appears OK in the "Potlatch 2" editor (and I presume that it will in JOSM too). The "iD" editor (which you were using here) uses a "background overlay" of GPS map tiles. The relevant one for your trace is here, but as you can see it doesn't include your trace. I believe that the software that updates iD's GPS background layer is here. Issues have been logged for update problems there in the past - this one might be relevant if you've changed the permissions, and there's also this one. There's another option, though - you can drag and drop local GPS files into the iD editor. That should allow you see them there. I'm not sure what "Go Map!!!" uses for GPS background, though (maybe someone can edit this answer and add details?). Hi edwardsaid, read this, https://help.openstreetmap.org/questions/24410/is-there-a-way-to-see-my-gps-track-overlayed-in-the-map-editor, the editor seems to be the bottle neck. Use JOSM and the file triggers the program and realizes the display of your trace.